While pregnant for the first time you hear lots of unhelpful things...horrific labor stories, that you will be tired for years, that your jeans will never fit again, and on and on. You take these in stride, remind yourself people don't mean to be discouraging (or down right terrifying), and quietly harbor a little hope your story will be different. So, labor - well, not a lot you can control there. Tired for years - we'll see, my kid actually sleeps pretty well. But what about those jeans? Did you really have to throw in the towel on having a nice body post-baby? I love my baby. A LOT. I would have children even if it meant I would never fit into those 'skinny jeans' again, but I wasn't ready to completely give up. I fully expected my body to be different, but a lost cause? I, for one, had a nice collection of clothing I frankly couldn't afford to replace. I don't diet. I tried it once. My family did not like 'Diet Bethany' - apparently, she is mean. I do eat relatively healthy: we rarely eat fast food (MAYBE once a month), I cook at home, I eat veggies with every meal. Nothing extreme, just balanced. I didn't feel right about dieting while breastfeeding and my main goal wasn't to lose weight (ok, that was a part of my main goal). My real desire was to get my strength back. So 'dieting' was out. That left exercise. I enjoy working out. Well, I really enjoy being in shape. Pre-baby I had run two half marathons. Five months post-baby, it really bothered me that I couldn't do a sit up without some serious effort. It was time to do something. I put this one first because I think it is an important step while planning what exercises you will be doing. I had open conversations with my doctor and my son's pediatrician (while breastfeeding) about the exercise I had planned. Pay attention to your joints. I don't know about you, but post-baby my joints felt loose for a long time. Be careful. First of all, give yourself time. For the first five months of mommy-hood I focused on figuring out how to keep my little boy happy and healthy. There is a big learning curve to motherhood. Also, I couldn't have exercised consistently if my son wasn't sleeping through the night and taking fairly regular naps. The timing for that is different with every baby. Also give yourself time to see results. It was well over a month and a half before I started seeing significant results. That first month was fairly discouraging, making it even harder to get motivated. I was working out for over an hour a day 6 days a week, but the results didn’t seem to line up with that. Stick with it! They say it takes a month to break a bad habit...I like to think of this as it takes a month to start a new habit. Get through that first month and working out will become your new normal. By that point you will also be close to seeing more significant results. It gets a LOT easier once you start making big progress. If there is one way to discourage yourself easily it is a daily weigh in. For one, there is no reason you should weigh yourself every day. You aren’t doing a crash diet. You are making a lifestyle change that involves working out and getting fit. Your goals will be on the order of months, not weeks. I weighed myself my first day of working out and then not again until about a month later. Then I touched base maybe ever 2-3 weeks. Funny thing was - once I started feeling in shape I almost forgot completely about my weight. The number wasn’t important. My story: I needed a program that I could do at home during my son’s nap time. Around this time my brother and mom were both doing P90x. (Yes, my 50 something mom was doing P90x - she is a former world champion powerlifter so it seemed normal to me.) It was a bit scary and sounded intense. So, naturally, I decided to try it. The pre-planned schedule and a variety of exercises sounded perfect for an overall body strengthening. Thankfully my family split the cost and gave it to me as a birthday gift. (I have since seen the DVDs on craigslist and ebay for cheaper - worth checking out if you are interested.) After the first workout I could barely lift my arms. I have no idea how, but even my eyeballs hurt. Ugh, could I really do this? If you aren't familiar, most of the P90x workouts are an hour long with the exception of Yoga which is 90(!!) minutes. I was tempted to give up, but I just had to know what my post-baby body was going to be. I stuck with the exact P90x workout plan for a few more weeks...long enough to identify a few things that weren't working for me. For one, the 'plyometric' workout was a LOT of jumping. That was too loud for nap time and my knees still felt a little loose. The cardio workout was fine, but if I was going to do cardio why not incorporate some running. I missed running. No, I really missed running. With a few adjustments I settled on this workout schedule. This one stuck. P90x was great, but can be a bit overwhelming and is not for everyone. So what was it about P90x that gave me results? It came with a pre-set schedule: I highly recommend setting a workout schedule or plan. Creating this up front (allowing for tweaking if necessary) will get rid of the daily inner struggle. If you wake up knowing exactly what is on the workout schedule that day, there is less chance you will talk yourself out of it. It had variety: Give your specific exercise program lots of thought. It should include a variety of exercises. Don’t focus only on the areas you are comfortable with - stretch yourself a bit. Also, involve both cardio exercises and strength training. And finally, include some serious focus on your core. Your post-baby body really needs this. To help you stay motivated, include exercises you enjoy. It grew with me: The program allowed for different levels of fitness, giving options for easier and more difficult movements. It pushed me: It pushed me in terms of commitment and frequency. I work out roughly an hour a day six days a week. That is a LOT of exercise - more than I thought I could maintain. It was a stretch goal. Several of the workouts included exercises I was unfamiliar with (pull-ups...really?). I would have shied away from the unfamiliar, but instead I was motivated to make new progress. I can do it at home: No need to go to a gym. Very little equipment. Fewer barriers to entry and flexibility. This might seem counter-intuitive, but I have found that setting a goal just past what you think you can do is sometimes the most motivating. For example, I have two friends who have never been ‘runners’. The thought of running a 5K (3.1 miles) was scary. They both completed the Couch to 5K running program and have been incredibly encouraged. They are even looking into 10K and half marathon training programs. They achieved something they didn’t think would be easy and now they are less limited. I had a similar experience when I ran my first half marathon. I had run 5Ks and one 10K, but 13.1 miles actually terrified me. I signed up anyway. I knew that if I didn’t train I couldn’t do it. I couldn’t approach it halfway and expect to come out still standing at the finish line - that was incredibly motivating. 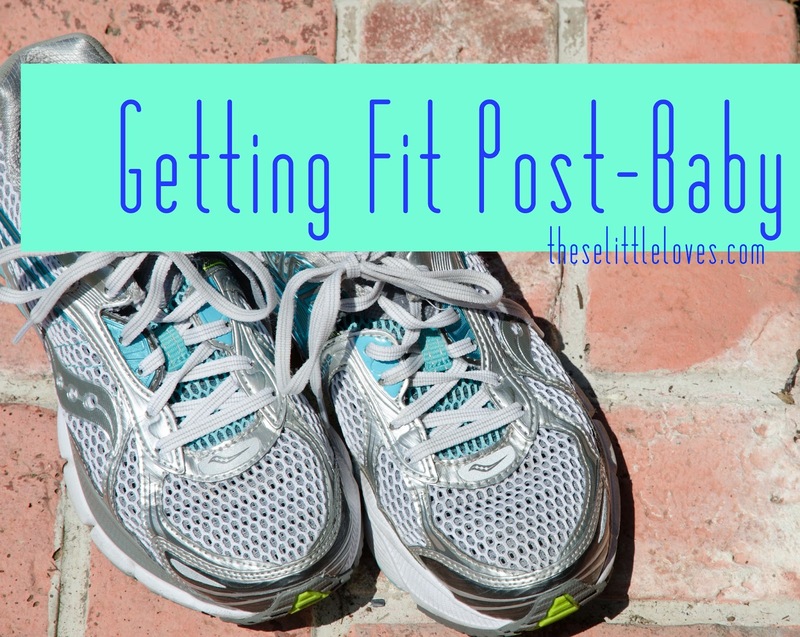 It pulled me off the couch on days when I didn’t feel like exercising. And when I finished the race I wanted to tackle a full marathon!...Just kidding;). I’m not that crazy. But I did want to do more half marathons. This looks different for everybody. Some need a workout buddy to be there every day. Others (like me) actually prefer working out alone - It is ‘me time’. Either way you need support. I have an incredibly supportive husband. My mom was also there the first week of workouts showing me the ropes and was always excited when I would call with my progress. These two people were invaluable to me over the last 5 months. After a few delays from being sick, I finally finished my plan this week. How do I feel? Strong. Lean. Basically fantastic. I lost 14 lbs. I can run 6 miles again. And get this...my pre-baby clothes (yes even those jeans) are loose! Is my body different? Maybe a little, but honestly it is hard to tell and I don't really care. I feel great. I am now gearing up for half marathon training. I just got in the random draw to run the Nike Women's Half Marathon in San Francisco this year. I put together a schedule with a little more running and the P90x more as cross-training. We'll see how that goes. I've just started it and it might be crazy. I wonder sometimes if I will get the same results after baby #2 or #3. We'll see. I figure getting in good shape between children and staying active (with Dr supervision!) during pregnancy are a start. Maybe with toddlers running around the house working out is less of an option. If not, well, who can be too sad when you have a sweet new little bundle of joy. That is, after all, what is really important.